Buckhead - Neel, Robinson & Stafford, LLC - Providing excellent service for over 21 years. 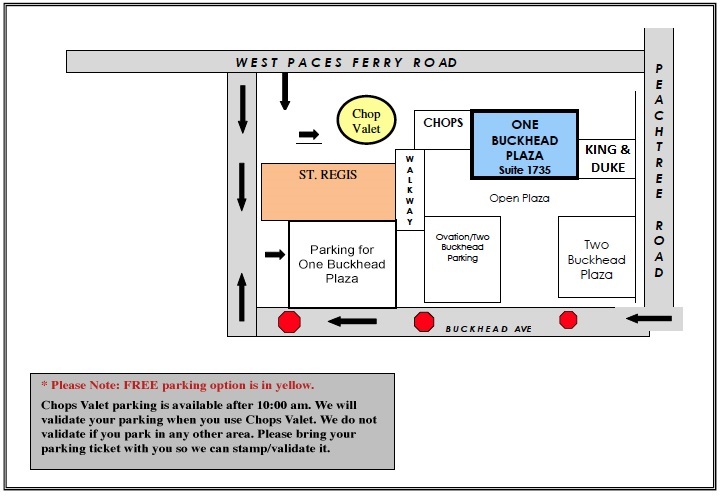 *These directions are to Chops Restaurant Valet Station adjacent to our building, One Buckhead Plaza. We validate parking for Chops valet service. Please bring your valet ticket to our office for stamping. However, we cannot validate a ticket from any other valet service, parking lot or deck. The map below shows a more detailed map for the streets around One Buckhead Plaza. Take first exit – Lenox Road. Turn right on West Paces Ferry Road. If you pass the St. Regis Hotel you have gone too far. Take Exit 2 and turn right onto to Lenox Road NE. Turn left onto Piedmont Rd NE. Continue 1 mile and turn right on West Paces Ferry. Continue 1 mile and turn right on West Paces Ferry Road.